Every time you deal enough damage to lower his health by 25% (i.e. - 75%, 50%, 25%), he will become immune to damage and "morph" (for lack of a better word) into a circle of lightning. Make that PIE of lightning. The reason I say this is because there's one little "slice" of his lightning pie that you may stand in and avoid the lightning damage. Alternatively, if you have enough time, you can run to the alcoves to the right or left of his platform and wait out the ability there. This guy has been changed recently. Everytime he casts Disperse, run away from him. The adds he summon are invulnerable but do an annoying aoe. Basically my group tanks him where he starts, then run down the stairs. After about 50 yards, the sparks will go back to where Ionar disappeared and he will reform himself. I believe this also has an aggro wipe component. In phase 1 stay spread to reduce damage from Static Overload and dodge incoming Ball Lightning. As far as I can tell, the boss does not drop aggro when phase1 starts again. One thing to pay attention is not to run to different sides when phase2 begins as it may cause lack of healing and result in deaths. Also the healer must return back fast after phase2 or will risk losing the tank. Might mention that he is a Lightning Revenant, that are in a sense minor elementals that served as foot soldiers for the Old Gods. After the war between the Titans and the Old Gods, the revenants were banished to the Elemental Plane, however some were later summoned back to the Mortal Plane by various wizards. They are undead creatures that has no relation with The Scourge and they live only for hatred and death. Most famous of the revenants is the Guardian of Frostmourne who guarded the cursed runeblade Frostmourne and warned Arthas not to draw the blade from the pedestal. And also Razor, the lightning revenant used by newer DotA players. I'm seeing a lot of DotA references in WotLK, though this was probably not intentional. When he blows he becomes "electric spiders" .. just run away from them and he will spawn back into normal. And stay away from electric ball he shots, it does 2.1k damage. mmm...not sure what happened but after the first split he just kind of..dissapeared for a bit..no sparks..
Disperse is like Kael's little orbs during Gravity Lapse. There is no aggro wipe between phases, and DoTs still tic on him and do damage during disperse. While the smaller air elementals before Ionar are immune to nature damage, Ionar himself is not immune to nature damage. This boss can be two manned even on heroic with a decent Tank/Healer. So even if the rest of the grp dies may as well try and ride it out. Just make sure the healer avoids ball lightning! 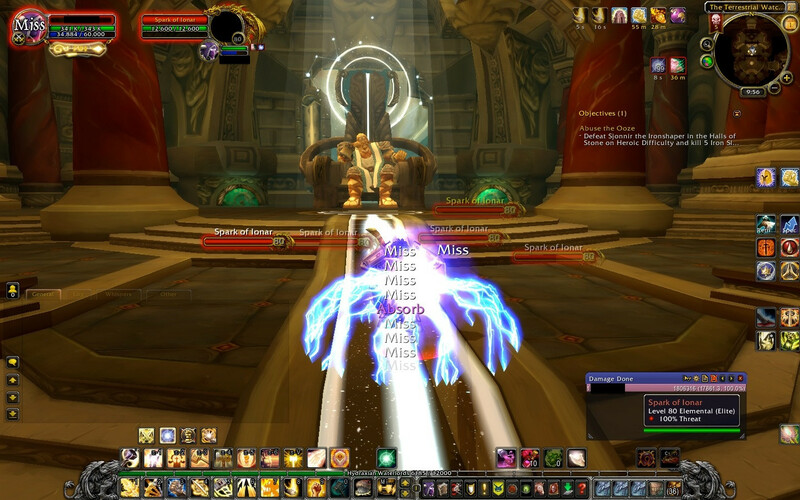 I found a good method, when he disperses, is to have the DPS run down the stairs and out of the way while the Tank and Healer run in circles to grab him when he gets back up. Ionar, in the Halls of Lightning, will now only disperse once during the course of the fight. For those of you that like to push yourself, or just amuse yourselves by beating an old "used to be mildly difficult boss" to smithereens, it is possible to beat him before he disperses. I did it on a ilvl 376 DW frost DK with all CDs popped. Open with Horn of Winter, then Pillar of Frost, AotD, and then Minion (so he gets Pillar's buffs). It's close, but it certainly can be done. Found out today it's possible to kill him as he disperses, if this happens the Spark of Ionar npc's he summons will never un-summon and follow you for the rest of the dungeon. 静电过载 – Ionar charges a player with energy, inflicting Nature damage over 10 sec and periodically zapping their nearby allies for Nature damage. After 10 sec, an electrical explosion occurs causing an additional Nature damage to all players within 8 yards and knocking them back. 球状闪电 – Ionar hurls a ball of lightning at the target inflicting Nature damage to a random player. 散布 – When Ionar reaches 50% health remaining, he disperses into Sparks of Ionar that pursue players for 15 seconds. 弧光灼烧 – Sparks of Ionar inflict Nature damage to the closest player within 5 yards. Players hit by Arcing Burn take 2% additional Nature damage for 10 sec. This effect stacks.